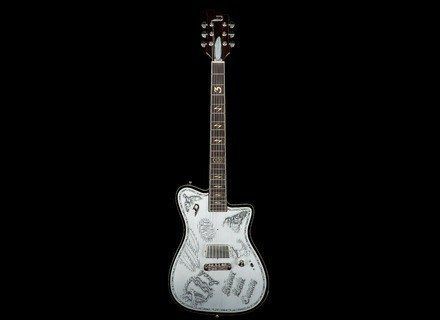 Johnny Depp Signature, Hollow Body/Semi Hollow Body Electric Guitar from Duesenberg. Woody Allen, Bruce Willis, Hugh Laurie are all active on screen and on stage — like Johnny Depp, who has recently teamed up with Duesenberg. According to the brand, Hollywood actor Johnny Depp is a Duesenberg fan and owner of several guitars by the German manufacturer. This led to a collaboration that resulted in the upcoming release of the Johnny Depp signature guitar during the Winter NAMM Show 2014. Duesenberg has not made public the details of the guitar, except for the fact that it incorporates Depp's tattoos in its design. The pictures made available so far make us believe that the guitar will have a single pickup and volume control. This year's NAMM will see the introduction of a limited edition comprising 52 hand-signed guitars. A production version will be released later during the year, with a portion of the proceeds going to Johnny's charities. More info to come at www.duesenberg.de. [NAMM] Ola Englund signs with the Randall Satan Ola Englund will have the place of honneur this year at NAMM, with a new series of Washburn guitars and a Randall Signature amp head.